The Noida authority on Monday started work on an eight-lane Rs. 450 crore bridge running parallel to existing Kalindi Kunj Bridge. “We have begun mobilizing construction material and equipment etc today to start building the pillars for the bridge. Work of bridge is expected to be completed in next 24 months,” said Yadav Singh chief project engineer (CPE), the Noida authority. The work on this project got delayed owing to delay in getting environmental and other requisite clearances. NOIDA: In a bid to reduce travel time between Delhi and Ghaziabad, the Noida Authority wants to build a double-decker elevated road from Sector 63 towards NH-24 and has sought an NOC (no objection certificate) from the National Highways Authority of India (NHAI). "The starting point of the double-decker elevated road will be at Chijarsi village in Sector 63. 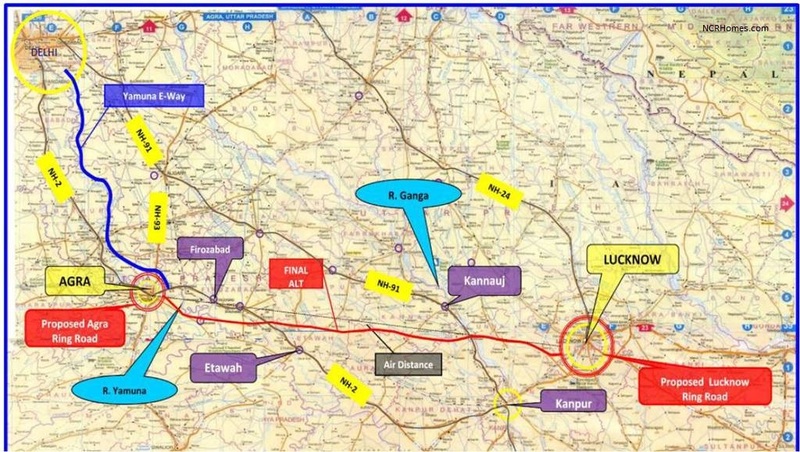 It will circle over NH-24 and provide exit and entry points from Delhi, Ghaziabad, Bulandsahar and Meerut," said KR Verma, in-charge of work circle 4. DDA website crashes as 'Housing Scheme 2014' launched; 25,034 flats up for grabs Posted by: Preeti Panwar Updated: Monday, September 1, 2014, 17:49 [IST] Use ← → keys to browse more stories 0 DDA launches 'Housing Scheme 2014' Ads by Google TATA Promont @ 2.47 Crore Exclusive Hilltop Residences by TataHousing, Bangalore. Know More! tatahousing.in/The-Promont 2 BHK Flat in Dombivali Palava Dombivali 45L Onwards! Luxury 2BHK Flat Sale in Dombivali. lodhapalava.indiahomes.com/BookNow New Delhi, September 1: The highly-anticipated 'Housing Scheme 2014' of the Delhi Development Authority (DDA) was launched on Monday at the Vikas Sadan, its headquarters , as locals and people from neighboring states stood in long queues to buy the application form on the very first day. Let us accept it. Metro tracks cannot be built in every nook and corner of the city owing to a variety of reasons – congested localities and Ancient Monuments and Archaeological Sites and Remains (Amendment and Validation) Act, 2010, just to names two. As per the Act, new construction is prohibited within 100 metres of a protected monument and there are restrictions on construction within 100 to 300 metres. Such restrictions are bound to create a problem in the city strewn with hundreds of protected monuments as was evident in November 2011 when the Archaeological Survey of India (ASI) issued a stop-work notice to Delhi Metro Rail Corporation on the proposed Central Secretariat-Kashmere Gate section at Janpath. So what are the options? Experts believe that rail-based transport systems like monorail and Light Rail Transit System in Delhi should be the available options. In fact, the Delhi Cabinet last month gave in-principle approval for the monorail connectivity between Shastri Park Metro Station and Trilokpuri, via Laxmi Nagar in east Delhi. “Fast and pollution-free elevated intercity new mode of transport Mono Rail has also been recommended as a mass transit in Master Plan Delhi (MPD) 2021. Besides having less noise as compared to other systems, it will also be aesthetically attractive,” Chief Minister Sheila Dikshit had announced. Monorail will be a realty in Delhi by 2017, she added. According to a government official, it has been decided that the route will start from Shastri Park Metro Station passing through Yamuna Pushta Road, Rajaram Kohli Marg, Geeta Colony, Patparganj Road, Nirman Vihar Metro Station at Vikas Marg, Ganesh Nagar, New Patparganj Road, Sanjay Lake to terminate parallel with proposed Trilokpuri Metro Station. In a major move displaying Walk-The-Talk, the realty major has re-started alloting the plots to the original applicants who were awaiting the plot allotment since 2005. The allotments are being made in Wave City NH-24 in sectors 15, 16, 17 & 18. These sectors are very close to upcoming Eastern Peripheral expressway and the 60 meter road from Noida Extension to Hapur. Even though these new sectors 14/15/16/17/18 may look located in interior but time would tell that they are located to newer infrastructure development areas (Eastern Peripheral Expressway and Noida Ext-Hapur master road in Greater Noida Phase 2. The Ph 1 plots are expected to be ready by mid-2013. The best returns on these plots are expected at that time (25-35 K psy).